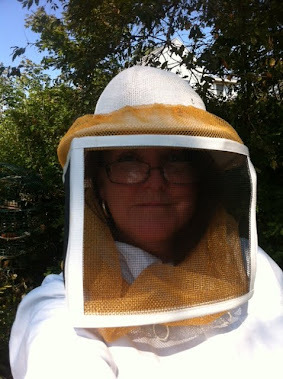 Abbott Honey: My First Swarm and other thoughts about having hives full of Honey and Bees! 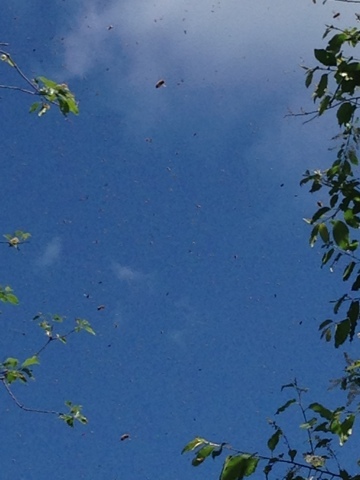 - The Swarm landed very High in a Tree but we couldn't get it all Down! 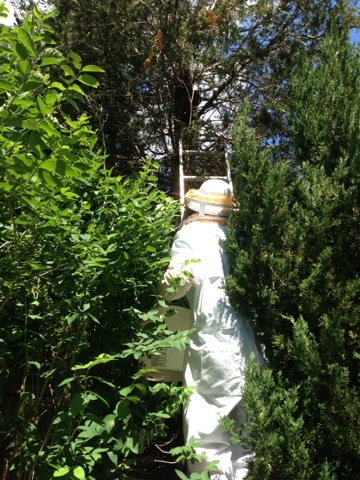 My First Swarm and other thoughts about having hives full of Honey and Bees! 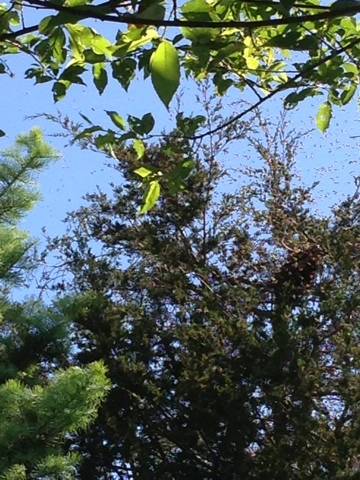 - The Swarm landed very High in a Tree but we couldn't get it all Down! Bees in the Air everywhere! 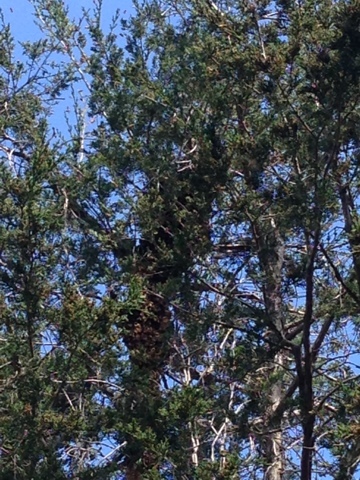 against the tree in the top picture but that is where the Swarm went after what looked like a million bees flew around the yard and then all landed on a tree. The energy was electric! I had never seen anything like it in my life. My sense is that since I was not prepared for for this event and it was probably an old queen leaving and taking some workers with her, then, it would be just as well to let them go. I went over and looked in the hive it came out of and it was still teaming with honey and bees. I had been in the hive about 10 days before and there wasn't nearly that much honey, but it must have gotten congested in the brood box. 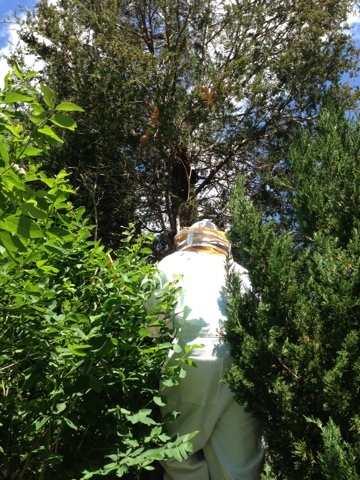 After this experience, I know what I am looking for now and I can just get new equipment and split the hives if they get too blocked up in the future. 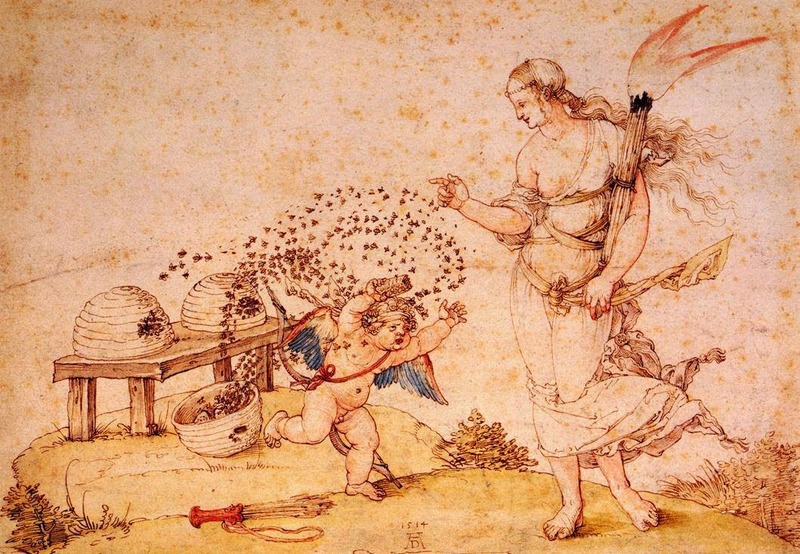 I am ready to harvest a June crop of honey alright. 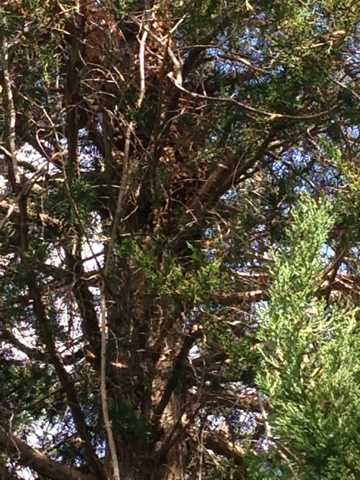 Anyway, We tried to get the swarm down from the tree but it was too high. We put some of the bees we did get into a bucket and then into a NUC I had and my thinking was maybe the rest of the bees would see that was a nice little home and tell the rest of the bees to move in to the sweet little NUC condo..... but...alas, they all flew off to places unknown later in the day. They were just too plain high! 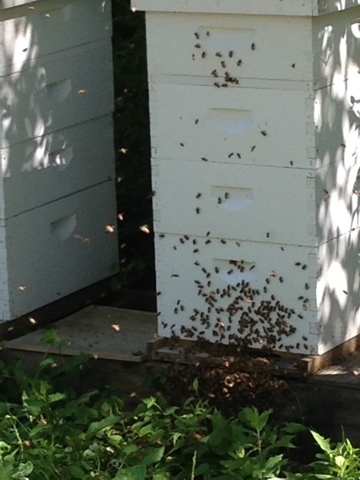 My little Nuc (small box on green table) with some of the bees in it. There are birds living in that bird feeder. It was a "No Go" though, we didn't get the queen so they all flew off with her. I saw on the internet that you can put old queens or queens you don't want in alcohol and then use that as a bee lure if you want to try and lure a swarm. I also saw that there are these long handled bee nets on a German keep keeping website and I think they might be a positive thing in the future. I could maybe use a fishing net instead. It's pretty High Up there!! So, I had a swarm, yes, and it sort of caught me by surprise! It seemed like an energetic day as it was just after the Tropical Storm Andrea and it had rained a lot. The sun had come out and the air had an energized quality to it. I think I should have removed some honey before the Hurricane but I just wasn't sure it was ready. After looking it the hive after the swarm, I saw a lot of capped honey ready to go. I tried installing some Palmer Bee Escapes but they didn't work but it is hard to tell because it has done nothing but rain since the Swarm. I want to get into those hive and smoke them really well and get some of the honey frames out. I decided to order a triangular bee escape from Brushy Mountain Farm and I am waiting for it to arrive. So there will be more news on how I do with the honey I am going to harvest one day real soon. We didn't catch the swarm but it was an amazing experience just being around it and witnessing it. Thanks to Mari and Charlie for trying to help out. I am really ok with the natural course of how bees move out into the wild. It seems natural. 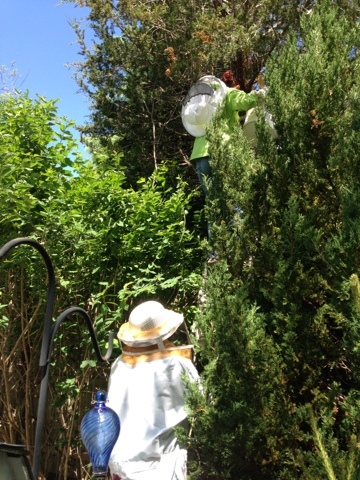 Everyone is always saying there needs to be more bees so yeah, guess, there are a lot more bees on Cape Ann. I wonder where they are and if they found a nice hollow tree. When looking around the neighborhood there are so many hollow trees and trees with holes in the trunks that I am pretty sure they located a place like that and have a new home. My husband asked me if I thought they were going to come back. He was really worried that all my bees had flown away. I assured him that they didn't all fly away. 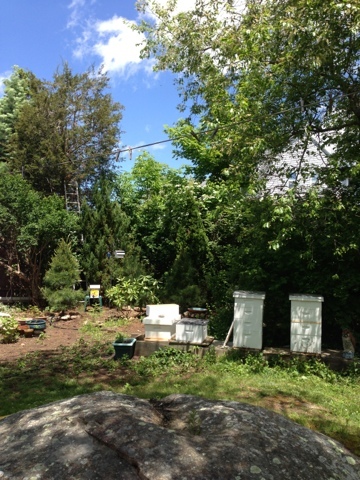 I can't believe how many bees I have in those two established hives. I read some Michael Bush Natural Beekeeping and he says that if you aren't making mistakes, you aren't learning. I have to agree with that because I sure did learn alot about bees in an experience way. I feel a little more attuned to the crowded hive. Michael Bush also says that all we need to do is just help the bees and not hurt them and I can see that in this instance, this is really true. 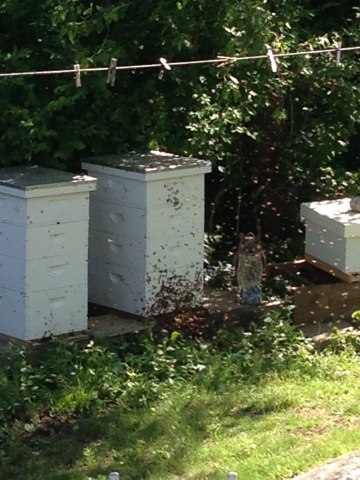 I may move some frames of brood (after I make sure the queen isn't on the frame) into my new starting out hives. I learned this is supposed to give the colony a nice kick. 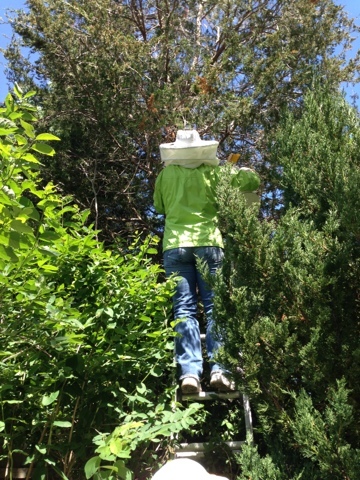 Another trick is to switch the hives but I don't think I am going to do that, at least not yet. In the future, if I want additional hives, I am just going to order more equipment and split the hives.